British auction house Bonhams just auctioned a miraculously well-preserved Benetton-Ford Formula One car campaigned in the 1991 and ’92 World Championship seasons, with a final bid of €1,058,000 (about $1.2 million) being raked-in by the sale. Among the list of illustrious past drivers of this Ford-powered Formula 1 car is the great Michael Schumacher, who used it to score his very first podium finish at the Mexican Grand Prix in 1992. Other past drivers include three-time Formula 1 World Champion Nelson Piquet, who drove the last Grand Prix of his career in the car, and racing commentator/pundit Martin Brundle, who made his Benetton team debut in it. This Benetton-Ford race car is powered by a 3.5-liter Ford V8 that’s bolted directly to the monocoque. The engine has a stratospheric 13,800 RPM redline and a 12:1 compression-ratio, resulting in a peak output of 730HP. The monocoque itself, minus the engine, transmission, and everything else, weighs just 83.7 lbs thanks to the use of carbon-composite. 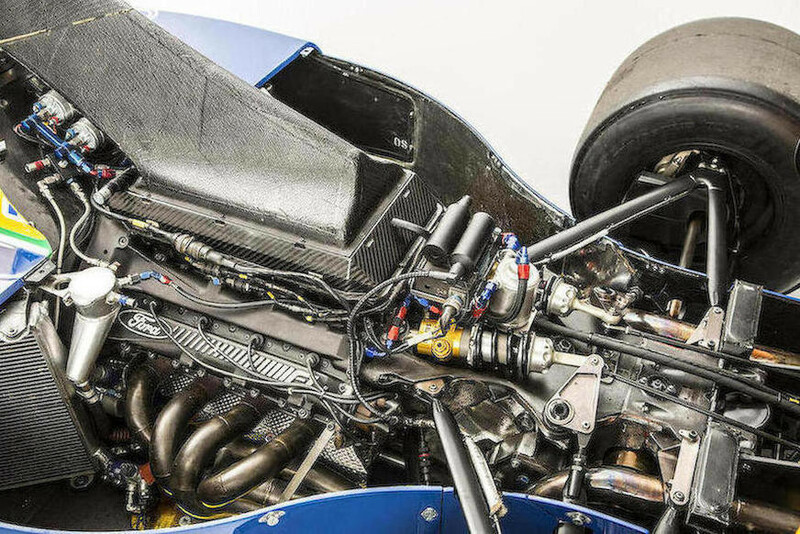 A pushrod suspension lends the car the incredible handling demanded by Formula 1 competition, and the six-speed transmission was among the last ever used that did not feature electronic paddle-shifting, sticking with a traditional lever instead. This Benetton-Ford Formula 1 car was kept in near-perfect condition by the previous owner, thanks to his own specialist race-prep company. For more history and photos of the car, be sure to visit the original auction listing at Bonhams.